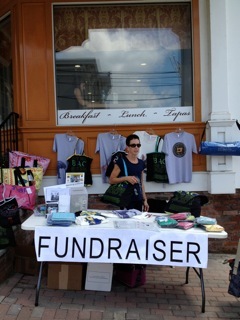 NN: Lori Grossi transformed her town through her fundraiser, Shop for a Cause. Her work to raise awareness through the sale and promotion of Nomi Network products was wildly successful, not to mention hugely encouraging to Nomi’s executive team. Thank you for your unstoppable passion, Lori! LG: I have always known of the horrors of human trafficking. I am a clinical psychologist by profession and more aware than I would like to be at times of some of the horrible indignities suffered by people in the course of living their lives. But ever since I learned earlier this year, that the event of the Superbowl is considered to bring about the “single largest incident of human trafficking in the United States”, I wondered what I could do to bring attention to this relatively unknown and reluctantly acknowledged fact. The idea that the most celebrated sports/social event of the year would be a breeding ground for some of the most despicable treatment of one human being by another was beyond the pale. 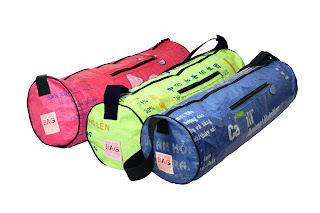 So when I recently purchased a new yoga mat bag and a signature tote from Dig Yoga in Lambertville, NJ, and learned that these were just two of the many products produced by survivors and women at risk of human trafficking, I realized that I may have found the answer. I went immediately to my computer and with a mix of skepticism and enthusiasm, I began looking for as much information as I could find on the non profit organization known as Nomi Network. I read all of the information on the website. I located financial records and I investigated the legitimacy of this fledgling nonprofit. I needed to be satisfied that the interests and motivations of the organization were sound. And I was more than satisfied. I could let my enthusiasm guide me. The story of Nomi was moving. The interest, daring, and commitment shown by the co-founders, Diana Mao, Alissa Moore and Supei Liu in giving birth to this idea, heartfelt and deeply human. 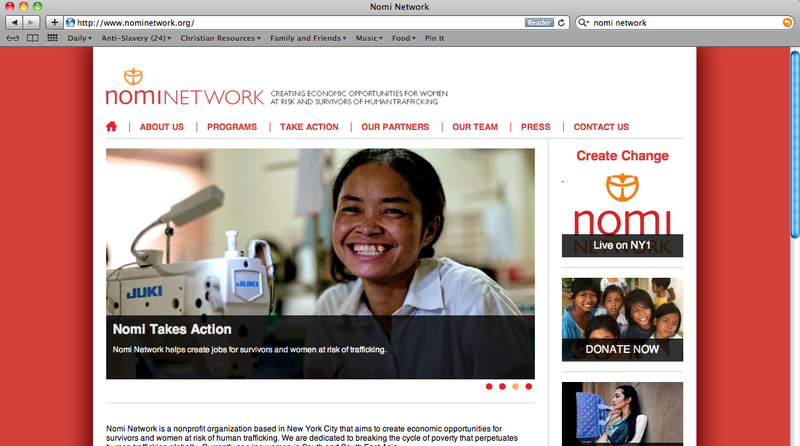 I loved the fact that Nomi Network included programs to help survivors and women at risk not only escape the bonds of human trafficking, but to rebuild their lives and become financially independent through a variety of educational and skill building programs. And I was impressed by the ability of Nomi to attract a large network of volunteers and partner organizations willing to give of themselves in the interest of helping transform the lives of others. I wanted to join their forces. I contacted Nomi Network to inquire about a home show and eventually decided to expand the idea to include a more public fundraiser. With the guidance and help from Lisa Kim, Legal Counsel and VP of Sales and Operations, I was able to bring this idea to life, bring attention to the plight of survivors and women at risk of human trafficking, and raise about $4100.00 in less than one month! I “kicked-off” the fundraiser with a dozen friends at my home the night before I was scheduled to set up my display downtown, looking to garner support and encouragement from friends and family. All of my guests were passionate about the need to address the problem of human trafficking and their conversations reflected that. They were generous in their purchases of “incredibly high quality products” and quick to add additional funding by “rounding off” to the nearest, $10, $20 and even $30 total amount, thanking me for bringing this issue out in the open. To say I was deeply moved by the collective spirit of the night would be an understatement. I was excited for the next day to arrive. And arrive it did. From the time I set up my display until the last hour of the day, men and women came to pay homage to survivors and women at risk of human trafficking. I was amazed. The women from the gym showed up in numbers. Local shopkeepers and business owners came by to show their support. Friends, and friends of friends, clients, family members, people who had seen the press release in the newspaper, others who had seen the posters in shop windows, all came by to SHOP FOR A CAUSE. And almost every single one of them, said “thank you” for taking the time. 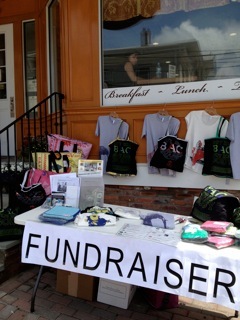 I had planned on making the fundraiser a success, having purchased almost $2700.00 of merchandise in advance. And I was determined to not return one item even though Nomi is willing to process returns for a small repackaging fee. But I never imagined that I would be able to sell so much merchandise in so short a time. By the end of the day, I had sold about $2300.00 of the original order and had put in an additional order of about $300.00 for specifically requested items that I had run out of. During the course of the next couple of weeks I sold the remainder of the merchandise. And I plan on doing another fundraiser sometime between now and the upcoming 2013 Superbowl which is scheduled to take place in New Jersey. Upon reflection, I am convinced that more people care about social issues than it would appear. And a good number of people are specifically moved by the horrors of human trafficking but do not know what they can do about their concerns. The fundraiser offered an option and an outlet that attracted many to the cause. Additionally, I believe it was very helpful to talk to people directly, invite them personally, and provide them with information about trafficking on a local level as well as on a global level to make it clear that this is not a problem that happens to other people in other places from which they are immune—just in case it made a difference. My favorite product is the signature tote bag in the block style. I ordered 35 of them and sold every single one. It is the piece that first drew me in to Nomi—with it’s brightly colored lettering and trim against a dark background, it’s strong fabric construction and bold—I will not be silenced—statement. 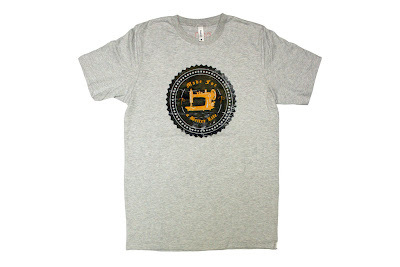 It is that product that embodies the spirit and lives of those that it is created to serve. And it is that product which I hope one day will become obsolete. what an amazing effort and inspiring story about a community coming together! and this is just the beginning. well done to Lori and all who helped make this happen.